Use the form on the right to send us a quick message. To send us a more detailed email, please CLICK HERE. 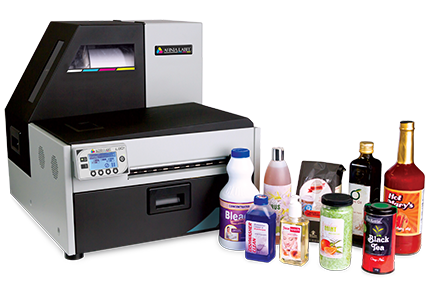 The L501 is the first label printer with Duo Ink Technology, designed to print with both pigment and dye inks. This dual-ink feature allows for a quick transition from dye-based vibrant and colorful prime labels, to ultra-durable pigment-based label applications with a simple printhead swap. Creating professional labels on demand is easy with the L301. Bringing short-run label printing in-house saves time and money. Eliminate lead times, setup fees, plate changing fees, and order quantity minimums associated with outsourcing labels. The L301’s continuous roll printing capability allows businesses to print professional-quality labels as needed. No more wasted time, wasted money, or wasted labels.